On Sunday morning at the GSPCA we met 9 keen dog lovers who were looking to find out more on dog first aid. We have been holding a series of training courses at the GSPCA and this weekend we trained a further 9 attendees what to do for their canine friends if faced with a first aid situation. Last Wednesday the GSPCA welcomed 14 new volunteers to the Animal Shelter and on Sunday another 3 keen cat lovers were taught about cat first aid. Sarah Creasey the Animal Education and Welfare Officer inducted 14 new volunteers who were keen to help in all sorts of ways from fund raising to mucking out. 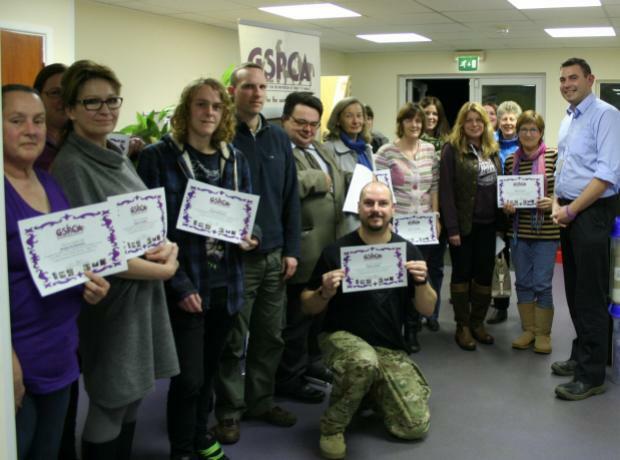 The evening consisted of introductions, all about the GSPCA, health and safety and the areas that those that attended can help here at the GSPCA.